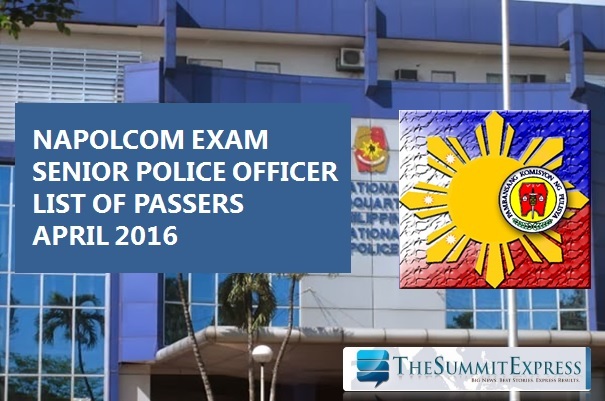 MANILA, Philippines - Results are out for April 2016 National Police Commission (NAPOLCOM) promotional examinations - Superintendent, Police Inspector, Senior Police Officer and Police Officer. NAPOLCOM announced that 3,483 passed the Senior Police Officer exam which was conducted in several test locations nationwide. The three-hour entrance examination for the promotional examinations include general information, police administration and operations, and police customs and tradition/values and ethical standards. NAPOLCOM said that individual reports of rating will be mailed to all examinees. Verification of test results is being entertained at the NAPOLCOM central office and its regional offices nationwide. The National Police Commission conducts two sets of police exam every year.